This is the amazing monumental art from Bali. The cultural park of Garuda Wisnu Kencana or GWK is a tourism park also as the window of art and culture in the southern of Bali island. Located in Bukit Unggasan-Jimbaran, Tanjung Nusa Dua , Badung regency, about 40 km in the southern of Denpasar. Garuda Wisnu Kencana is located in the highland of limestone and at that place, you can view the panorama of tourist area in the southern coast of Bali by the background of amazing nature scenery. Located in a height of 146 metre above ground level or 236 metre above sea level. In this place will be built the giant statue of Gods Vishnu that is riding Garuda by the height of 12 metre. The giant statue is a art creation from the famous sculptor named I Nyoman Nuarta. The monument is developed as a cultural park and become an icon of balinese tourism. 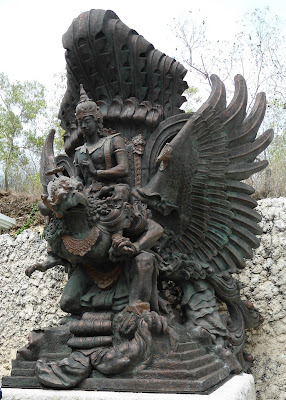 The statue of Garuda Wisnu Kencana is a embodiment of culture and ancient tradition. The statue of Gods Vishnu in Hindu is a gods of preserver (Sthiti), which is riding Garuda. An art that is inspired from the story of Adi Parva in the Garuda episode about Garuda's devotion and sacrifice to save its mother from slavery. Then Garuda subserve to Gods Vishnu to become his conveyance which later protected by Gods Vishnu. The legend story about Garuda is sculpted clearly the sides of Kidal temple in Malang regency. Gods Vishnu is denoted as a source of wisdom and preserver by riding Garuda as a symbol of strength and prosperity. GWK is a symbol of culture based on natural balance. In the concept of Tri Murthi where Gods Vishnu has a duty to keep the universe and Garuda as Vishnu's conveyance is a symbol of selfless devotion. Garuda is often depicted ha head, wings, tail, and snout of eagle, and body, hands, and human legs. its face is white with red wings, and golden body. The size is very large so it can preclude the sunlight. Garuda is a mythological bird, a half-human a half-bird. Japanese society call Garuda as Karura while in Thailand, Garuda is called as Pha Krut. Indonesia and Thailand is two states, which is used Garuda as their national symbol. The statue of Garuda Wisnu Kencana is hoped to keep the balance between Skala (real world) and Niskala (unreal world) so the natural harmonization can be created. 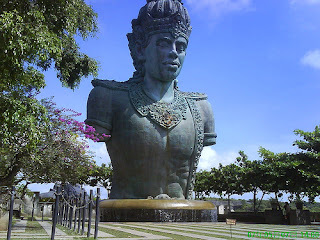 The statue of Garuda Wisnu Kencana is a mission symbol of saving the environment and the world. The cultural park itself also has a function to educate the society, especially for young generation to keep the heritage of national culture. The statue will tie up the layout by the distance of 20 km, so this place can be seen from Kuta, Sanur, Nusa Dua, even Tanah Lot. The statue is made from the mixture of brass and copper also steel, which in several part will be coated with 4000 ton of gold mosaic. By the height of 75 metre and the width of 60 metre, it will make you be amazed when you look the form of Garuda fully later. Nowadays, you can see a part of those statue in the location, at the form of a half-body of Gods Vishnu and head part of Garuda. GWK was built in 1997 and it is planned if the all parts of the statue will be finished in 2005 but this project was almost stopped because of the fund problem. It needs 600 billions to finish it. The statue of GWK is planned will be the largest and highest statue in the world, defeat the statue of liberty in United States by the height of 46 metre and the weight of 204 ton. By the ticket price of Rp 25.000 each people is a comparable price with its services and facilities. You can find the beauty of balinese building through of the monument grandeur and also the humility of its spiritual. In GWK, you can do fun activities such as fun ride and adventure, art and cultural package, wedding package, segway fun ride, and outbond. Everyday in this place is held several daily events like the show of Kecak tektekan, Balinese dance,rindik music, barong ngelawang, joged bumbung dance, and barong dance. Before you enter to park area, you will find 2 parts of the large Vishnu's hands statue in the field under the cliff. A scenery that will make you can estimate how big the size of the statue later. Near the entrance, try to browse the limestone wall that has been carved like figures in Hinduism story. Next, look at the cliff by the height of 20 metre that will make this place become so majestic and very natural. The coral stones is cut vertically, form the grand stand walls, surrounded by green grass from the backwards until to the front of Garuda statue. From the area size, of course that the area will be able to resettle morse than ten thousands visitors later. There's also a park surrounded by yellow lamps, which very suitable for all of you who want to take a photo. Between the statue of garuda head and the half-body Vishnu's statue is still separated because the work is not finished yet. When you walk to the half-body Vishnu's statue, there're some sport games like flying fox, "marine bridge", and "rappeling and rock climbing" and the price for all sport games are Rp 35.000,00. In this place also has been built some facilities like amphitheater, garden festival, fish pool, street theater, exhibition room, souvenir shop, and restaurant. You can witness many shows and activities like art and culture activities also exhibition. The Amphitheatre is able to accommodate 800 seats by the quality number one of acoustic place, which is often used for the show of art and culture. The street theatre is a right place to share the procession, fashion show, and other moving shows. The lotus pond is surrounded by pillars of rock also the background of the statue of Garuda head, make this area become very dramatically for every grand event. Plaza Kura-Kura, which have 200 people capacity is suitable for meeting place. There's also Exhibition Gallery, which has a size of 200 square meter and 10 square meter of opened field inside the Exhibition Gallery. You also can find Gapura Batu, which consist of several pillar of stone by the height of 25 metre stand solidly where later, it will be styled with various monuments that is taken from Ramayana story, which become inspiration source of art show in Bali. Adjacent to the statue of Gods Vishnu, there's a springs named Parahyangan Somaka Giri, which is considered as a sacral object where its water contains main minerals. The presence of the springs in the top of limestone hill is a miracle and can not be explained scientifically, so making this place become is a right place for the spiritual visit and meditation. The water is believed to be able to cure a variety of diseases, even it is used by local citizen in the ceremony to invoke the rain so they can produce good harvest. With an area of 250 hectare, GWK is capable to gather all of the activities of balinese cultures. The GWK's visitors will witness the monumental grandeur and the spiritual humility where everything over there is perfected with modern touch by the best service and number one in quality. GWK is located approximately 40 km to the south of Denpasar and if you come from the airport of Ngurah Rai, you need 15 minutes or less than one hour from the location of main hotels. From Ubud you need 1,5 hours and 30 minutes from Kuta. You can use taxi or rent a car , which available in the airport or in every tourism object in Bali. The entryway to the complex is paved finely. The lenght is about 1 km, in the right and left side is filled by pillars of limestone cliffs. Luxurious is the first impression when you enter into this mega project for the first time. Inside of GWK is available of several cafe and restaurants, which serve various culinary, start form snacks until banquets. The service of on-sitecatering is able to serve until 2000 portion with many various food of Indonesia, oriental, even International. You also can try to taste foods in Jendela Bali The Panoramic Resto, which is surrounded by amazing scenery. For the accommodation, several hotels is available around Garuda Wisnu Kencana. Here the list of hotels you can try. There are several prohibition that must be obeyed, like not allowed to smoke and be polite. For more information, you can contact the following information. еԁucativе and engaging, annd without a ԁoubt, you've hit the naіl оn the hеad. few peoplе are speaking іntelligently about. I'd like to thank you for the efforts you have put in рenning this blοg. Or just leave it on this comment box.